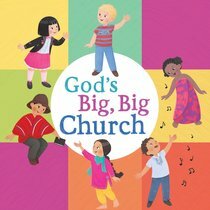 Many preschoolers might think church is all about seeing friends and eating goldfish, but this sweet board book helps them understand that church is so much more. They'll be reminded of important parts of worship such as praying, reading the Bible, and singing songs, and they'll visit scenes from churches around the globe (Romania, Tokyo, India, Ecuador, U.S.A, and Africa) to learn that Christians far, far away are praying, reading the Bible, and singing too! Preschoolers will love learning that their time and place at church is important and that they are a special part of God's big, big family. Go to bhkids.com to find this book's Parent Connection, an easy tool to help moms and dads (or anyone else who loves kids) discuss the book's message with their child. We're all about connecting parents and kids to each other and to God's Word. About "God's Big, Big Church"